ABC: FRESH OFF THE BOAT held at 0.7, while SPEECHLESS was down 0.1 to 0.5. A 2-hour 20/20 lost 0.1 to 0.7. 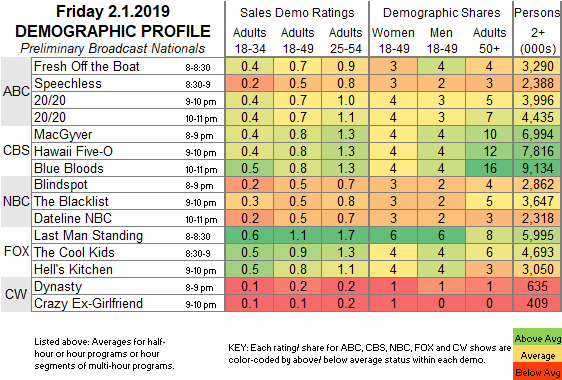 CBS: MACGYVER and HAWAII 5-0 returned from a week off at a steady 0.8/0.8, while BLUE BLOODS aired a new episode for the first time since January 11, and was also steady at 0.8. NBC: BLINDSPOT, THE BLACKLIST and DATELINE all returned from a preemption week down 0.1 to 0.5/0.5/0.5. FOX: LAST MAN STANDING and THE COOL KIDS both aired their first episodes since January 11, and were down 0.1 to 1.1/0.9. HELL’S KITCHEN was up 0.1 to 0.8. CW: The newly-renewed DYNASTY rose 0.1 to 0.2, and CRAZY EX-GIRLFRIEND remained at 0.1. It’s a sports-heavy weekend. Tonight, NBA and NHL games and the NFL HONORS special occupy 3 of the broadcast networks. On Sunday, CBS will own pop culture with its coverage of the SUPER BOWL, followed by the premiere of WORLD’S BEST. Most other networks will stay away, although HBO will air its regular line-up (already available via VOD/streaming).